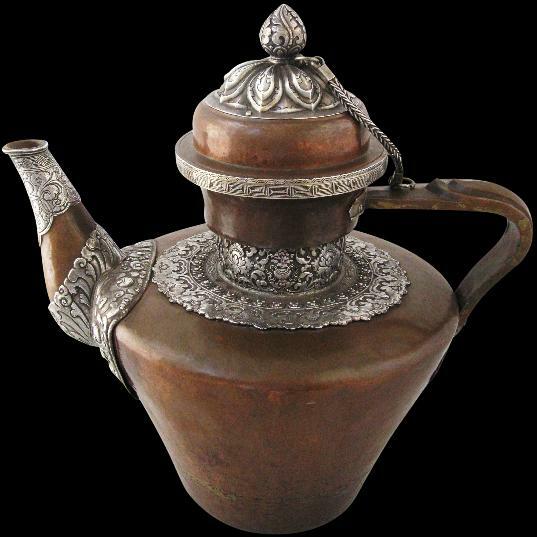 This magnificent and unusually large copper teapot with exquisitely chased and repoussed silver mounts is from south central Tibet. The silver mounts are the finest we have seen on a Tibetan teapot of these proportions. The neck of the teapot is covered in silver finely worked with a variety of motifs including Tibetan Buddhistic motifs, scrolling foliage, key-fret borders and very finely engraved stylised cloud motifs. The spout is partly encased in finely worked silver mounts including a wide, extravagant collar that is repoussed with eight wish-fulfilling gems among finely engraved scrolling foliage. The thick handle in hollow, hammered copper has a double elongated lotus petal motif. This sculptural aspect marks this teapot out as a particularly special piece. The closely fitting lid which lifts to reveal a tinned interior is edged with a fine, silver key-fret border. It is topped with a finely worked lotus petal plaque attached to the copper base via silver rivets. The plaque is surmounted by a finely chased silver lotus bud finial. The lid is attached to the base by means of a thick chain of woven silver wire. The front of the teapot is engraved with a small inscription in Tibetan script. Tea in Tibet was an important staple in the diet. The tea was made from Chinese black tea bricks. Butter from yaks and salt were then added and churned together to give a thick, soup-like liquid. This was drunk throughout the day by all social classes. This teapot would have come from an aristocratic family or perhaps a wealthier monastery. There are some minor dents associated with age and use and an overall excellent patina.